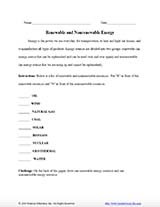 Use this educational worksheet to teach children about non-renewable and renewable energy resources. In this activity, students will learn about the differences between non-renewable and renewable energy resources. Then, they will review different examples of resources and will have to correctly labeled them either renewable ("R") or non-renewable ("N"). This is an excellent one time activity or review resource for students as they continue to explore science topics throughout grades 3-6.